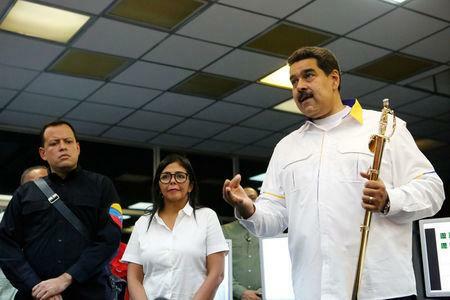 Venezuela's President Nicolas Maduro speaks during his visit to the Hydroelectric Generation System on the Caroni River, near Ciudad Guayana, Bolivar State, Venezuela March 16, 2019. Picture taken March 16, 2019. Miraflores Palace/Handout via REUTERS ATTENTION EDITORS - THIS PICTURE WAS PROVIDED BY A THIRD PARTY. ROME (Reuters) - High-level U.S.-Russian talks on how to defuse Venezuela's crisis ended on Tuesday with the two sides still at odds over the legitimacy of President Nicolas Maduro. Russia has said Maduro remains the country's only legitimate leader whereas the United States and many other Western countries back Juan Guaido, head of the opposition-controlled National Assembly who invoked a constitutional provision in January to assume an interim presidency. "No, we did not come to a meeting of minds, but I think the talks were positive in the sense that both sides emerged with a better understanding of the other's views," U.S. special representative Elliot Abrams told reporters. The Russian side also said the two sides now understood their respective standpoints better after the two-hour talks in Rome but Moscow's delegation chief, Deputy Foreign Minister Sergei Ryabkov was blunter. "Perhaps we failed to narrow positions on this situation...," Russian state news agency TASS quoted Ryabkov as saying. "We assume that Washington treats our priorities seriously, our approach and warnings." Ryabkov was quoted by Russia's RIA news agency as saying the talks were difficult but frank and that Moscow had warned Washington not to intervene militarily in Venezuela. Abrams said "who gets the title of president" in Venezuela was still a point of contention. He called Tuesday's talks useful, substantive and serious and said both sides agreed "on the depth of the crisis". Ryabkov said Russia was increasingly concerned by U.S. sanctions on the Latin American country. Hours earlier, the United States imposed sanctions against Venezuela's state-run gold mining company Minerven and its president, Adrian Perdomo. U.S. President Donald Trump has said all options are on the table for Venezuela, a position Abrams said the Russian side brought up at Tuesday's meeting. High-ranking military officers are seen as crucial to keeping Maduro in power in the face of a hyperinflationary economic meltdown that has spread hunger and preventable disease and led to an exodus of some 3 million people since 2015. Maduro's government, which retains the backing of Russia and China, drew widespread international condemnation after he was re-elected last year in a vote widely regarded as fraudulent. Abrams cited recent estimates that over the next few months Venezuela's vital oil exports would fall below a million barrels a day and that the country's oil exports were declining by about 50,000 barrels a month. "This a catastrophe for Venezuela," Abrams said.